These skeletal soldiers often initially appear as scattered bones on the ground and will assemble as you approach. They are untargetable until they start putting their head on, but can always be hit while they are reassembling after being staggered or knocked down. 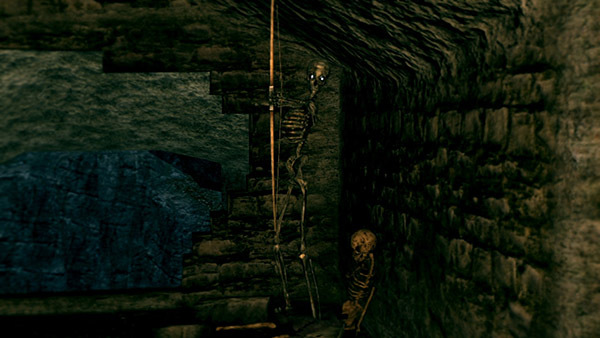 Every group of Skeletons (about 6 or more) in The Catacombs belongs to a Necromancer. 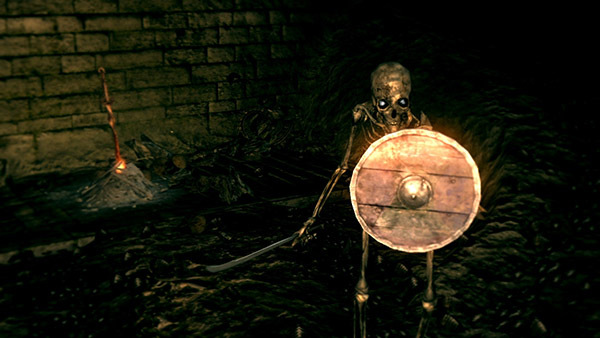 While a Necromancer lives, Skeletons under his command will reassemble themselves at full health after taking fatal damage unless the killing blow was dealt with a Divine weapon1 or by falling off a cliff where there is no ground to land on (for example off the path leading to The Catacombs). If it does land on ground it will revive where it landed. Skeletons only give souls when they are permanently killed so use this to confirm they will not revive. Killing a Necromancer who commands his own flock of Skeletons will stop those Skeletons from reviving, even if there are other Necromancers around. The Necromancers do not respawn. At the graveyard area, near the entrance to the Catacombs. These don't have a Necromancer master, and so do not reassemble. Common enemies throughout the area. Summoned by Gravelord Nito at the start of his encounter. He acts as the Necromancer for these Skeletons. Two quick slashes followed by backwards jump to avoid counterattacks. Switches stance to holding his scimitar pointed to your right. If you attack while they are in this stance, they will parry and severely injure you. 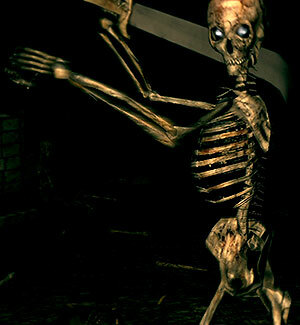 Corkscrew Dive Bomb Attack (for lack of a better name): The Dive Bomb Attack consists of the skeleton visibly "charging up" and then flying at you in a corkscrew spin for High Damage, shattering and re-assembling himself, leaving himself vulnerable for attacks. Note that their Falchion and Scimitar strikes cause bleed damage, even though those weapons don't cause that effect when the player is using them. For new characters, use a hammer weapon (e.g. Mace, or Morning star) to knockdown skeletons. They're vulnerable to knockdown by both quick and strong attacks from a mace, though the duration of their knockdown is longer with a strong attack. 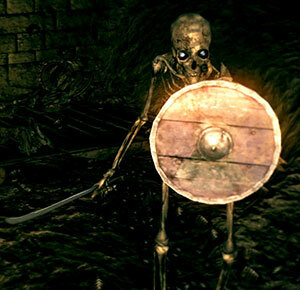 This allows the player to link together a series of quick/strong attacks and defeat skeletons unscathed. Can also be used to knock them off cliffs. 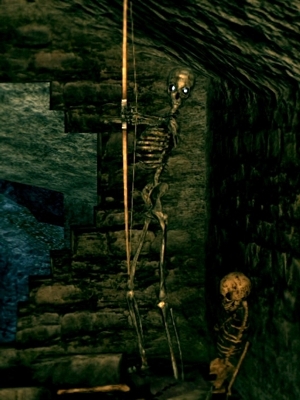 Like Hollow archers, Skeleton archers will run away from you if you take your time in getting close, so kill them quickly. Other than weapons in Divine upgrade paths, there are five unique weapons that have Divine property as well: Astora's Straight Sword, Greatsword of Artorias, Crescent Axe, Silver Knight Spear, and Grant. They also prevent Skeletons from reviving. 1. In Co-operative play, only divine weapons used by a host will stop a Skeleton from respawning. 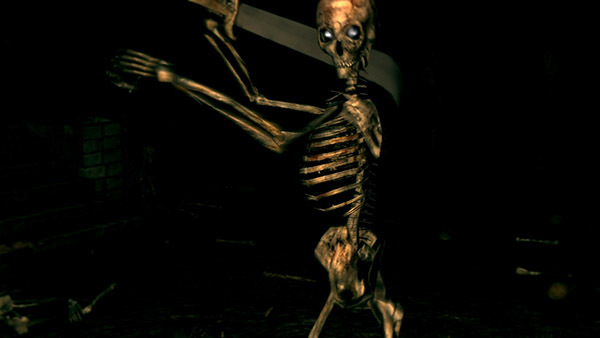 Also, if a skeleton dies during the reassembling animation, it will still respawn even if hit by Divine weapons.